Whoever said money can't buy happiness probably didn't know where to go shopping. Karachi's landscape, which is dotted with many shopping centres, could provide much relief in form of retail therapy to those seeking it. Shopping centres such as Saddar, Tariq Road, Zamzama, Zaib-un-nissa Street, Hyderi and Waterpump are popular for extreme shopping binges. Karachi's malls on the other hand; Park Towers, Forum, Millennium Mall and Dolmen Mall, attract hoards of people, not all of them looking to shop. Most people just enjoy hanging at the malls. Come heat, rain or power breakdown, Karachiites find refuge at the malls. This is not to say mall enthusiasts don't shop. Avid customers head out to malls to browse at their favourite stores, with a growing variety of brands available at all of them, from groceries and electronics to designer clothes; these malls house everything from local to high-end brands. "We have literally given our blood to Safaid Khoon," the graduates of National Academy of Performing Arts (NAPA), who are part of the institute's theatre repertory company, tell Kolachi, three days before their first production is to go on stage. "We want to build an audience for theater in Karachi," they add collectively. By staging plays regularly, students at NAPA hope to revive the lost culture of theatre in Karachi. Established in 2005 in Karachi with an aim to train individuals in the performing arts, NAPA's first batch graduated last month in the disciplines of Theatre Arts, Music and Dance followed by the launch of Pakistan's first ever Repertory Theatre by NAPA in April 2008. The repertory has selected Aga Hashr's Safaid Khoon as it's inaugural production at the Arts Council from April 24 to May 4, 2008 and is all set to produce five plays this year. These plays will be staged on a rotational basis after two-month intervals and will be based on dramas from literature around the world. April is about to end and Karachi is experiencing one of those strange in-between weather phases that herald the beginning of summers. An exciting thought, of course, as Karachi summers bring with them a whole host of things to do. Trips to the beach are mandatory, as is the wedding season. This is also the time of the year when relatives and friends living in other countries come home for vacations. Summers in Pakistan also mean that the monsoon season has arrived. This should be an exciting thought too, as the rains should provide relief from the sometimes stiflingly hot Karachi summers. But the first and at times, the only thing one can think of when thinking of Karachi rains is water pooling on the roads, making float-boats and rafts seem like a plausible choice for transport. Noor Jahan is a middle-aged woman who moved to Karachi from Lahore over a decade ago, when her first husband died and she married a man who lived in Karachi. Her life is often tough; as her husband and the son who lives with her are daily wage labourers who do not have a fixed income. 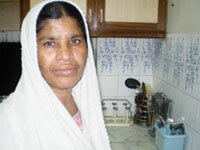 As a means to get by, Noor Jahan has been working as a housekeeper for several years. At present, she is working for two families, trying to make as much money as she can. 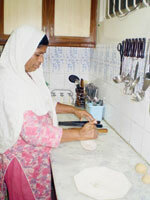 She is often ill, but as she has to provide for herself and her family, she cannot stop working. Kolachi: How long have you been living in Karachi? Since the last couple of years, brand conscious people who really want to adopt latest styles and fashion; even living in areas such as P.E.C.H.S or Nazimabad, which are closer to Tariq Road and Hyderi prefer going to Park Towers or Forum instead. When asked about this proclivity, Mrs Mohsin, a housewife visiting Park Towers, has this to say; "The primary reason why I prefer coming here is that everything is available under one roof. One doesn't have to go to several different places to get everything one needs." The trend of malls is on the rise. A big reason for this is the convenience malls offer shoppers. Secondly, they are covered and therefore are attractive keeping Karachi's unpredictable weather in mind. The biggest incentive is perhaps the play-areas for children and food outlets in the malls. Now children can accompany parents for shopping and can be left comfortably amongst their favourite cartoon characters and fun rides. Moreover, tired and worn out husbands can be enticed with pit-stops at fast food restaurants at the malls to refresh and energize themselves for further bag carrying. Malls like Park Towers, Forum, Millennium Mall and Dolmen in Karachi have lots of shops, along with huge food courts, especially Forum's Time Out, the double-storied McDonald's at Park Towers, which in itself is a big attraction for people and a pretty decent food court as well. Dolmen Mall too has a terrific food court. On the other hand if one thinks of Karachi's shopping centres, the first thing that comes to mind is bargaining and congestion. Haphazard parking and squalor are two staples which distinguish shopping centres from malls. The khokhas and food stalls situated in shopping centres sell cheap food items, but at the cost of the health of the people who choose shopping centres as shopping spots. Another factor that is making shopping centres slightly unpalatable is the rising trend of mobile snatching in these areas. Malls facilitate the shopping experience to a great extent. They actively promote their size with pride and offer a larger variety of merchandise as compared to smaller competitors. "You get better quality and variety, better display of goods and products, a better environment, better facilities like underground parking," says Nabeel, a mall lover, "there are decent toilets, security, and yeah, how can I forget; malls are centrally air-conditioned." His reasons for preferring malls don't end here. "Fixed prices save one from the headache of bargaining," Nabeel continues, "that international and designer brands are available is great and most of all, shopping is great fun, enjoy it!" Instead of investing too much time and energy buying cloth, bargaining, getting outfits stitched from a tailor etc., some shopaholics find it far more economical to visit shopping centres. "I can spend a little more time and energy in order to get a cheaper yet satisfactory product. Be it, toys, cosmetics, clothes, whatever," explains Hira Arsalan, who has always preferred shopping centres over malls. "Malls offer the opportunity to window shop, but only people with lots of money to spare can afford to actually shop there," she says. Asma Siddiqui, a shopper at Gulf Shopping Centre says, "The place is over-crowded with people and the shopkeepers forever make you feel like you're their very first customer of the day, even if you enter the mall 15 minutes before shutdown!" 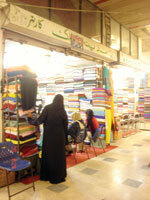 Asma also isn't a fan of bargaining and the din that is characteristic of shopping centres. "There are so many different voices pulling me in different directions," she says, "and bargaining with just one shopkeeper is exhausting! I had come here with the intention to just browse, but the shopkeepers' appeals coaxed me into buying a low-quality product, albeit at a cheap price." By this one can easily make out that the original price which shopping centres quote is an inflated one according to the quality of the product and hence bargainable. The bargaining process itself leaves one's mind and wallet equally drained. Rabi Centre, Jamia Cloth Market, Hyderi, Aashiana and a few more are the centres which attract shopaholics, especially during the wedding season. These centres offer a huge variety of wedding-wear at considerably lower prices than malls. As Tajwar, a bride-to-be points out, "malls offer designer labels. The same gota work that is done here is available at malls at thrice the price; I intend on getting my wedding outfit from Rabi Centre and party-wear from malls." Hira, the ardent shopping centre fan also loves the chapals that are available at a mean price at Gulf. "Chapal prices at malls and other shops start at 500 rupees, at 150 rupees, these chapals are great," she says, "they might not last that long, maybe a month, but at the price they come, that is more than enough." A large number of shoppers desperately want the number of malls to be increased here because of the comfort they provide to shoppers. Farrukh, a visitor at Park Towers, who has come from America, says, "I've been to many malls in America and I haven't really found a huge difference between those and the malls here." There are some differences, he says, "malls there are very big, they have cinemas, clubs, skating rinks and lots more, but the atmosphere is more or less the same; I love visiting malls in Karachi with my friends and just hanging out." 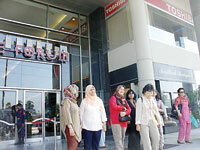 Huma Khan, a working woman shopping at the forum has some misgivings about trendy malls in the city. "Malls have become fashionable of late, when we were kids, I remember shopping at bazaars rather than at malls," she says, "the bazaars offered more variety. There is also this problem in Pakistan of chasing anything that glitters, which may or may not be gold. There is no guarantee of quality, even if one buys things at expensive malls." There was a time when fashion designers were a novel concept in Pakistan. There was a specific class which turned to designer labels or boutiques for outfits. In the last few years, that has changed. More and more people are more aware of latest trends and want to wear clothes that are in fashion. This is true especially of women who keep up with all the latest fashions and want to look better than best. Designers such as Amir Adnan, Aijazz and Junaid Jamshed have their outlets not just in malls, but other shopping districts too and are in great demand. This highlights the fact that fashion awareness has risen in Pakistanis, who keep up with latest trends and know what looks good. Fashion awareness has also led to people being brand conscious, or if one is to be very specific, conscious of where they buy an item. The same item bought at Park Towers is somehow more valuable than the one bought at Tariq Road. Despite the fact that shopping centres offer a large variety of brands as well cannot change the perception that the hip malls are better. In spite of the presence of many designer shops, when going shopping, one still has a tough time deciding where to go. It is not only a matter of brand consciousness, as brands of all qualities are available in Karachi with corresponding prices. Cheap brands are available at malls and centres along with highly expensive brands. Boutiques like Bareeze`, Cynosure, Generation, Deepak Perwani, Exclusive, Ideas, Instyle, Khaadi etc. are situated side by side with economically priced stores. Shopping can be quite an experience and shopping at a mall or shopping centres both provide experiences of very different kinds. In Karachi, luckily both can be had. Those seeking a comfortable environment with minimum ruckus can venture out to malls for their shopping expeditions, while those looking for fabulous items at competitive prices can brave chaotic shopping centres and districts. Either way, shopping in Karachi is an experience and a half! However, the repertory has selected Aga Hashr's play as their first instead because of, "the use of poetic and idiomatic language that Karachiites have almost forgotten now," says Talat Hussain, a veteran actor who is playing the leading role of 'Khaqan,' the emperor in Safaid Khoon. Talat Hussain goes on to say that Safaid Khoon is being staged to prove that, "comedy can be done nicely without being bawdy," a fact most of the young generation is oblivious of today. Talat believes Karachiites today are not familiar with decent theatre because of the trend of commercial theatre surpassing "artistic" theatre. History of theatre in Karachi can be traced back to the colonial period when, "Karachi was a happening place in terms of theatrical activity," Talat Hussain says. The culture is said to have continued even after partition and it took the form of a movement during the mid-'50s as observes Sigrid Kahle, the head of Karachi Theatre formed by the Theatre Group of Arts Council in 1956. In her essay, 'Theatre in Karachi during 1950s' included in the book Karachi ki Kahani, Sigrid says that after a lot of efforts on behalf of Sigrid herself and her Pakistani friends in the early '50s, "theater took a form of movement in Karachi." Rashid Karapiet, Khawaja Moenuddin, Zia Mohiyeddin, Abdul Wahab and Ali Ahmed are some of the names remembered by Sigrid and Talat Hussain as active participants of the "theatre movement" at that time. Dramas of Khawaja Moinuddin like Zawal-e-Hyderabad, portraying conditions of Kashmiris under Indian rule and Lal Qila Sai Lalu Khait Tak explaining the plight of immigrants from India to the newly born Pakistan were a great hit during the '50s. James R. Brandon in his book, The Cambridge Guide to Asian Theatre, observes that Lal-Qila Se Lalu Khait Tak enjoyed an audience of nearly 10,000 people and ran for 140 performances. Theatre is believed to have enjoyed a golden period in Karachi during the '50s, when a lot of plays were staged regularly and a lot of people would actually buy tickets to see them. Theatrical activities flourished in Karachi till the late '70s and started to decline afterwards. Some blame the rise of commercial theatre while others view lack of theatre halls and government support behind the decline of theatre. "That was decent theatre," Paras Masroor, a NAPA graduate playing the villainous role of Bairam in Safaid Khoon remarks. "Theatre at that time promoted quality language and was decent enough to be enjoyed by the entire family," Paras continues, adding that another reason for selecting Agha Hasha's play as the repertory's debut play was to revive the long forgotten culture of family oriented entertainment. With a cast of approximately 45 actors (with all leading roles played by the graduates and the rest by NAPA students), Safaid Khoon has been adapted from the Shakespearean tragedy, King Lear. The play depicts the 12th century and revolves around a king, his three daughters and the drama resulting due to the conflict between the king and one of his daughters, Zara. Fawwad Khan who is assisting Zia Mohiyeddin in the direction of the play tells Kolachi that while staging Safaid Khoon, emphasis has been given on sceneries instead of a proper set because, "that is how Agha Hashr used to stage his plays." Fawwad adds that Safaid Khoon is a melodramatic play with rythematic dialogues, music, dances, comedy and conflict. "It is actually a mix-plate," he says, "because mix-plate is what people of the subcontinent love to have." He adds that Agha Hashr had to add three comic relief scenes in Safaid Khoon because audience at that time was "entertainment-driven" and was not ready for an entirely serious play. 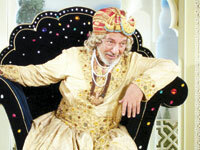 Fawwad tells Kolachi that given the similar nature of audience today, those interludes are not excluded from the drama. As the actors at NAPA's Repertory Theatre rehearse for the play while aiming to revive theatre culture in Karachi, they are convinced that this is not an easy task. "There is no persistent tradition of staging theatre in Karachi," says Paras, adding that except for some groups or individuals like Tehrik-i-Niswan by Sheema Kirmani, there is not much that caters to a large audience in Karachi. "Though it is one of the most effective medium of communication," Paras thinks, "theatre is the most neglected art in Karachi." Unlike the big screen, which is a medium of the director, theatre is regarded as a medium of the actor as he builds a direct contact with the audience, "and the message is communicated effectively due to the human touch," explains Ali Rizvi, another actor in the play. Ali says that despite the lack of audience, he selected theatre as his medium of communication because, "theatre educates one to express himself effectively." Besides the effectiveness of the medium, some graduates from NAPA opted for theatre as a profession instead because, "we want people think of issues greater than saas-bahu conflicts," says Paras, adding that television channels of today like Star Plus tell people how to cope with their in-laws, while with quality theatre him and his peers want people learn ways to cope with social problems. "We want to provide Karachiites with varying perceptions so that they don't think stereotypically," Paras says. Fawwad seconds Paras. "We know we can't bring a revolution in one year," he says " but we can at least make people think." The team of Safaid Khoon thinks that Karachiites are in dire need of theatre. The more they get, the more better it is for them. "Every Karachiite leads a very hectic life," remarks Mahreen, another graduate actor from NAPA and Media Coordinator for the play. She adds that during this hectic routine they need entertainment and time for their family. "Theatre may not only serve the purpose of catharsis for them," she says "but it can help them socialize with their family and friends as well." "Therefore," shares Safaid Khoon's team, "we want Karachiites go to the theatre, regularly." Things have gotten better, of course, over the last couple of years. During the 2006 rains, the then young Clifton Underpass had flooded to the brim with water and Main Clifton Road and adjacent roads and streets were flooded with feet-high water as well. A massive power breakdown that lasted days was what made things quite nightmarish that year. The following year, 2007, wasn't so bad. A new drainage system had been laid out in the area, hence flooding was kept to a minimum. Power breakdowns did punctuate rains in 2007, but the fact that roads did not flood too badly was a matter of some relief. However, katchi abadis in the city, as well as fishing villages took a massive hit that year. In 2007, rain-related deaths were mostly caused due to head injuries, I actually remember reading this in a news report and thinking, "come again?" Over the years, rain related death causes have run the gamut of drowning, electrocution, diseases caused by the general filth that spews from beneath Karachi grounds during rains; but head injuries was definitely a first. This had happened as Karachi's skyline at that time sported huge hoardings, the number of which ran into thousands, only a small percentage of them legally installed. When cyclonic winds whipped through Karachi, they brought these boards tumbling down. Tragically many of these boards fell on people sometimes, who got severely injured. As some wise official had remarked to a news channel back then, "we learn from our mistakes." But there are some ground rules that are just so elementary, that one shouldn't have space to make those mistakes. For instance, do not install 10 000 hoardings more than are allowed and if they are installed, make sure safety regulations are followed to a T. Secondly, rain flooding is always crazy in Karachi, a proper drainage system should have been installed after the very first floods by rain. In any case, we are getting to the proper drainage system very, very slowly, but apparently surely. Currently 26th Street in Defence and adjoining areas which include Khayaban-e-Shamsheer, Sehar, Muhafiz etc. are being dug out to install the drainage system that has eluded them for so long. But as development works in Karachi have a way of evolving suddenly and all together, this digging out of most roads in one area has been sprung on residents at the same time. As a result, those commuting from those areas and to those areas have to consider alternate routes and those who do not live in those areas often get caught between a maze of cordons as they try to seek a way in and out of a certain place. Consequently, most traffic from 26th Street etc. has found it's way on Sea View and Shahrah-e-Firdousi. Never before has one seen so many cars around Abdullah Shah Ghazi's mazar at 12 am as of late. Hence seeking alternate routes around the rough terrain of Defence a few nights ago, I realized I have learnt a couple of new things about Karachi. As I was forced onto Sea View in order to find a road I was familiar with, which hadn't been barricaded, I was overtaken by young boys on fast bikes, zooming and vrooming through the night. Fascinating, as this was a week night and the next day wasn't any kind of holiday. I asked a friend who lives in the area if this happened often and was told that Thursday nights are designated for racing, (bikes, cycles). This is something I did not know despite having lived in Karachi for the better part of my life. April and May are generally exam-months; this is when mocks, finals, board exams etc. take place. Hence April and May are when students cram, learn and go into autopilot. The city government too, much like the student who crams one night before the exam, seems to be trying to cram in as much preparation for the impending monsoon season as it can in a month or two. Happily, though, despite the inconvenience all the development work is causing residents of the aforementioned areas at the moment, being areas that are often heavily flooded during rains, they can heave a sigh a relief for this year's rains being easier on them than before. And if this is anything to go by, then perhaps Karachi will be better prepared to combat the monsoon season this year. Noor Jahan: I was born and bred in Lahore and came to Karachi after I got married. Kolachi: Do you like Karachi? Noor Jahan: Yes, I do. I have my family and work here. Kolachi: Don't you want to go back to Lahore? Noor Jahan: Two of my girls are married and are in Lahore, but I don't feel like going there for more than a visit. But then some times I get so sick of my life in this city that I don't want to live here and want to go to Lahore. But mostly I go there just for a change of environment. Kolachi: Why don't you shift to Lahore if you are that miserable here? Noor Jahan: I can't; my daughters' in-laws are nasty. They would never keep me with them and I don't have anywhere else that I can live so I come back after a while. Kolachi: how many children to you have? Noor Jahan: I have two daughters and two sons. Kolachi: You mentioned that your daughters are married in Lahore, what do your sons do? Noor Jahan: One of my sons is married and is a fruit vendor, but doesn't live with us the other one is a drug addict and he lives with us. Kolachi: Did you not send him to school? Noor Jahan: I did, but he doesn't like going to school. He would bunk school, so now we (my husband and I) don't force him. Kolachi: Why doesn't your older son live with you? Noor Jahan: I live with my second husband and he doesn't want my older son to live with us. Kolachi: What happened to your first husband? Noor Jahan: He passed away due to ill-health. Kolachi: Do you have any kids with your second husband? Kolachi: Does your husband work? Noor Jahan: Yes, he is a labourer. Kolachi: Is what you earn enough for the three of you? Noor Jahan: No it isn't enough, some times I have to ask my older son to pay the house rent. Kolachi: What do you do for entertainment in the city? Noor Jahan: When my daughter comes to visit us from Lahore, or some times my son takes all of us to Seaview, we take biryani, nan, shami kebab and coal with us to have a little barbeque. It is a lot of fun, but that doesn't happen very often. Kolachi: What is it that you don't like about Karachi? Noor Jahan: I like everything about this place. That's the reason I'm still here and don't go anywhere else. This place, no matter how bad it gets, is home to me. Kolachi: The law and order situation in Karachi hasn't been very good of late, didn't you then want to leave the city? Noor Jahan: I have been living in this city for a long time I have become used to all that. It wasn't for the first time that something like that has happened in Karachi. Karachiites are used to it. Something like that can never make me leave the city. Karachi is a city chock-full of all sorts of people, all doing the best they can to live decent lives. They are sometimes dealt hard blows, but no matter how tough times get, most Karachiites have the ability to bounce back quickly. Noor Jahan is one of those people, no matter how rough her life has gotten, she has tried to make it better. It is the life of people like Noor Jahan, that makes Karachi's character.